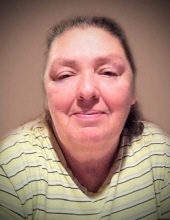 Rebecca Sue Ousley Hammonds known as Becky is the 64 year old widow of Harold Hammonds Jr. passed away from this life on Monday April 1st, 2019 at Baptist Health Hospital in Louisville, Kentucky. Becky was born on June 26th, 1954 in Prestonsburg, the daughter to the late Emit Ousley and Juanita Gayheart Ousley. Becky was a trained EMT for Trans Star Ambulance Service and a believer in the Baptist Faith. She is survived by her children: Dennis Hammonds and his wife Tracey of Banner and her daughter Helen Hammonds Flannery and her husband Darrin of Prestonsburg; her grandchildren: Susan, Dakota, Seth, Dalton, KP and Colton; her brothers: Gary Ousley and his wife Judy and Elmer Johnson all of Prestonsburg; her sister: Ramona Bowling and her husband Lonzo Bowling of Prestonsburg; and her special friends: Betty and Autumn Shell. And a host of Nieces and Nephews. Along with her husband and parents Becky is preceded in death by one granddaughter: Sophie Leigh; one brother: Carl Ousley; and two sisters: Rhoda Stanley and Loena Ousley. "Email Address" would like to share the life celebration of Rebecca "Becky" Hammonds. Click on the "link" to go to share a favorite memory or leave a condolence message for the family.